There are two kinds of people in the world; givers and takers! Proverbs 30:15 says “The leech has two daughters: Give and Give.” The leech is a reference to the bloodsucking horseleech that was common in Palestine. The ugly creature serves as an emblem of insatiable greed. If it could speak, it would say, Give! Give! 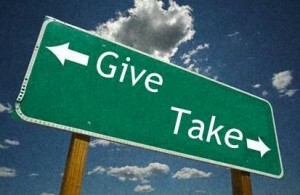 Give! The leech is like the fictitious vampire sucking the very life blood from all it comes in contact with. Christians should be just the opposite! We should all be givers. In his little book “Christian Living Beyond Belief,” McManis says, “God has commanded the church, and Christians in particular, to give. Jesus said, ‘Give’ (Luke 6:38). Paul commanded Christians to give financially to the church (1 Corinthians 16:1–4; Romans 12:8, 13). John exhorted believers to give to those in need (1 John 3:16–18). Hebrews 13:16 says God is pleased when we give to others. Giving is a basic Christian virtue. Giving to God and others reflects the very nature of God. God’s greatest act of loving sacrifice entailed an act of ‘giving’—‘for God so loved the world that He gave’ (John 3:16). One of the most telling barometers of a person’s spiritual maturity is their quotient for giving. God has repeatedly commanded Christians to be giving people, for they are recipients of the greatest gift ever given—salvation in Christ.